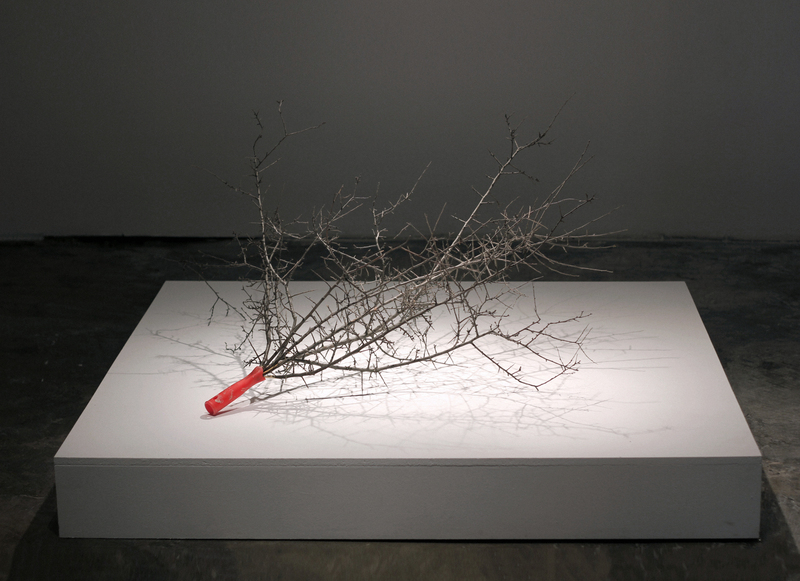 Romeo consists of a bundle of blackthorn branches, held together at the base by a red paint roller grip. This untouchable paintbrush immediately recalls the notorious fasces, the bundle of branches carried by a Roman magistrate’s personal bodyguard in order to open the way for him wherever he went. Outside the traditional boundary of capital, the fasces were bound together with a securis (axe), signifying the power to punish by death. This symbol of political power gained a second life as the emblem of the Italian fascist regime; the title, however, suggests a completely different story, namely Shakespeare’s tragedy of the strife between the Montagues and Capulets fighting for control over the city of Verona, and the illicit love between Romeo & Juliet. We may only wonder who the Montagues and Capulets of our times could be, and what romances are hidden behind their superficial political enmity. But blackthorn plums only make you feel like choking, so perhaps, in our alternative world, Romeo actually survives the end of the play, reanimated from a misplaced dagger wound.